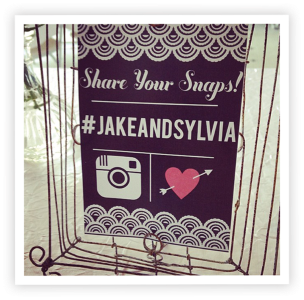 Want to use Instagram at your wedding, but not sure what hashtag to use? Can you just choose the first one popping into your mind and use that one? What do you need to pay attention to? Fortunately, it doesn’t have to take a lot of time to pick the perfect hashtag. Let’s break down exactly what makes a great hashtag, what the do’s and don’ts are when choosing one and how to pick yours. At the end of this article you’re sure to get the most out of your wedding hashtag! Keep in mind there’s no registration procedure for creating a (wedding) hashtag . Anyone on Instagram or Twitter can just choose one. That is why you want to make sure your hashtag is the only one for your celebration. Obviously you don’t want your collection of Instagram wedding photos mixed with stranger’s photos. This will mess with the intimate, special memories your Instagram hashtag will collect. Secondly, you want to give your friends and family a hashtag they can easily remember so they can and will use it. What would be worse than having guests use the wrong hashtag for photos never to be found again or only to be found when your guest wonders why their photo is not in your wedding photo album? Last but not least, your hashtag must encourage attendees to use it. It’s all about making it fun for your guests to post on Instagram. So, your Wedding Hashtag must be unique, encouraging and easy to remember. Make it unique: test search for the #hashtag you use and see if others are using it. Double check right before the wedding. Be open for some trial and error. Find out a couple used it before? You might wanna rethink your choice. Add a “wedding word” like “hitch”, “love”, “weds”, “happilyever” or “newlyweds” to appeal to your guests. Make your hashtag funny or a little bit bizarre, this will add to the appealing factor of your hashtag. Time to get creative! Add symbols, dashes or spaces, this will cut the hashtag. A good hashtag only consists of alphabetic characters (a-z, no special accents) and numbers. Just use initials and dates. Weddings tend to have these in common. #Useaverylonghashtagwithoutcapitalletterstodescribeyourwholewedding, because… You can see why. #WOJAAWSID, would you know what that says? No you don’t… It doesn’t make any sense because it’s the abbreviation of Wedding Of John And Amy Who Say I Do. With these tips in mind, it should be a clear how to pick the hashtag that suits your wedding perfectly. Take some time to create a custom hashtag for your wedding that, in a great way, will add social media to the most social event of your life. Make it fun, unique and appealing to use. 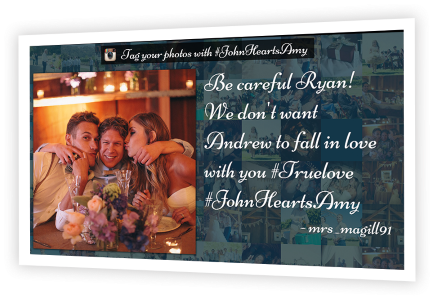 We do like to help you creating a unique and easy to remember wedding hashtag that your guests will love to use. 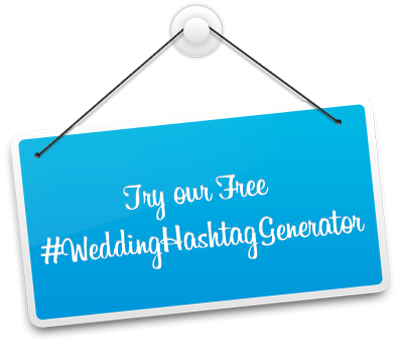 Our Wedding Hashtag Generator automatically generates a list of hashtag you can use as a great starting point! Need a bit of help? Premium services like our friends at Mister Write offer professional writers who will customise the perfect hashtag for you. Checkout their stuff at misterwriteforyou.com. Once you have found your hashtag, it’s important to let all your guest know!